I scuffled my filthy boots in front of me as I turned away from them. On my scale of “muddy” it wasn’t even registering! A completely dry day with barely a squelch of mud around. If I walked the line the little girl did, I don’t think any mud would even stick to my boots! As the pair walked away her words began to tumble in my memory again. Last week in class we made mud ball seed bombs. “What’s the big deal” I asked myself. Of course, I have no idea of the context, perhaps she was on the way to something important where mud was not appropriate. Perhaps it was the guilt of the pile of mud sat not a few meters from us in my van, the remnants from making seed bombs. In the scheme of things it’s no big deal this mom didn’t want her little one to get dirty that day. There are however plenty of parents out there doing battle with an ever growing mountain of sticks at the back door or tumbling drifts of mud from their car boot as they take out the shopping. I’m sure I’m not alone when I scrub my sons muddy fingernails at the end of a wonderful day playing outside at kindergarten. When children get down to the basics of being inquisitive they inevitably get hands on. Some hang back and don’t get fully head-to-toe involved but they’ll be carefully watching what’s going on around them. 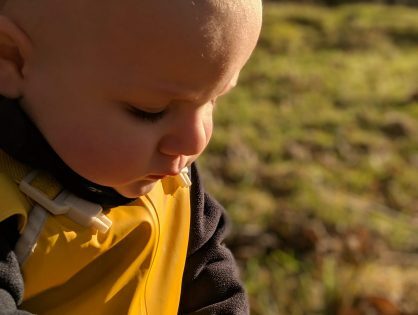 What I love most about children being outside is they’ll be using all 7 of their senses to explore their surroundings; so much more intensely than adults. Nature asks that we observe what’s around us. The changing seasons, wildlife in front of us and the weather all demand our attention and for the most part we as humans oblige. Discussing the inclement weather, the blossom on the tree or spotting a deer dashing through a field, we stop to watch and take it in. Imagine experiencing all of that for the very first time. There’s so much wonder in seeing a shooting star or playing in long grass, how lucky to be a child. This week my #steammsunday is a plea to you. Go outside, embrace the world around you and indulge in your little one’s inquisitive nature. Mud washes off whilst experiential learning sticks around. They’ll remember the times they played in the woods or went for a paddle in the stream. We need to help our little ones respect the world around us, after all they’ll be the ones to take charge when we’re gone. You can make a simple check sheet to try on your next outdoor adventure. I’ve listed a few below to get you started. FERN TIP: Try putting your little one in charge of a camera; either a phone camera or a camera they’re able to use. Ask them to take snaps of everything you find to show [insert name of important person in their life here.] It’s a great way to help them to be observant. The more enthusiastic you are, they will likely follow suit! Have fun, get muddy, laugh and learn. Then head home for warm baths and relive the adventures in your bedtime stories.